Welcome back at part three of my blog post series about IPv6 for pen testers. In part 1 we already covered the advantages of IPv6 and how IPv6 addresses look like and in part 2 we discussed the three different IPv6 address types and how Link Local adresses are generated. I encourage you to read both posts before continuing as they cover the basics for this entry. We will now take a closer look at IPv6 multicast and how Layer 2 address discovery is implemented. With IPv6, multicast will be a fundamental part of every network and will even replaced all broadcasts. This is especially important as broadcasts have been a problem for years in large networks as they are sent so all systems in the whole network and thereby cause a lot of unnecessary network traffic. Furthermore every broadcast has to be processed by the end device and thereby wastes processing power. However without broadcasts a problem arises: ARP the Address Resolution Protcol used for resolving IPv4 to MAC addresses and thereby enabling the necessary OSI Layer 2 communication can not be used anymore and a replacement has to be defined. By enabling IPv6 and by configuring an address the system not only allows you to communicate using this address but also automatically joins two IPv6 multicast groups. The first is the already mentioned Solicited-Node multicast group. It is dynamically generated by taking the last 24 bits of the corresponding IPv6 address while prepeding the ff02::1:ff00:0/104 Solicited-Node multicast prefix. The second is the IPv6 All-Nodes multicast group ff02::1 that is joined by all IPv6 capable systems. Now let us recap using an example: By setting up the IPv6 address 2000::9999:1111 on System A it will join the Solicited-Node multicast address ff02::1:ff99:1111 and the All-Nodes multicast address ff02::1. If in turn System B wants to send data to System A (2000::9999:1111) it needs both the IPv6 address and the corresponding MAC address. To get the MAC address, it sends a Neighbour Solicitation (NS) message to the Solicited-Node multicast address ff02::1:ff99:1111. System A will reply with a Neighbour Advertisement (NA) containing its MAC directly to System B. After that System B has all the necessary information and can send data to System A. The image below illustrates the process. Beside the discovery of Layer 2 addresses this process is is also used to avoid address collisions. 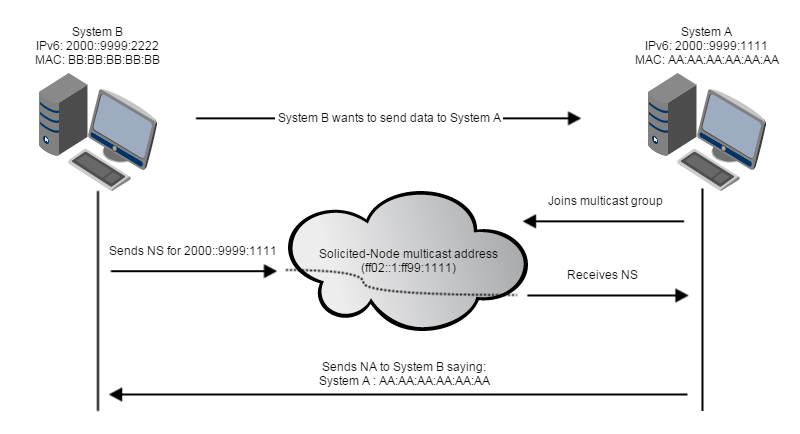 Before a new IPv6 address is assigned to an interface the systems sends a Neighbour Solicitation message to the corresponding Solicited-Node multicast address. However instead of using the interface’s IPv6 address – which has not been set up yet – the unspecified address :: is used instead. If the address is already in use the owner replies with a Neighbour Advertisement to the IPv6 All-Nodes multicast address and the setup process is aborted. If no answer is received within a given time frame it is assumes that no-one else is using it and the setup continues. This process is called Duplicate Address Detection (DAD). To summarize, we covered what IP multicast is and what it is used for. Furthermore we talked about IPv6’s ARP replacement namely Neighbour Discovery and how it works in detail. In the next and final part we will then cover how IPv6 Addresses are managed without the need for a DHCP service and why you still need one.